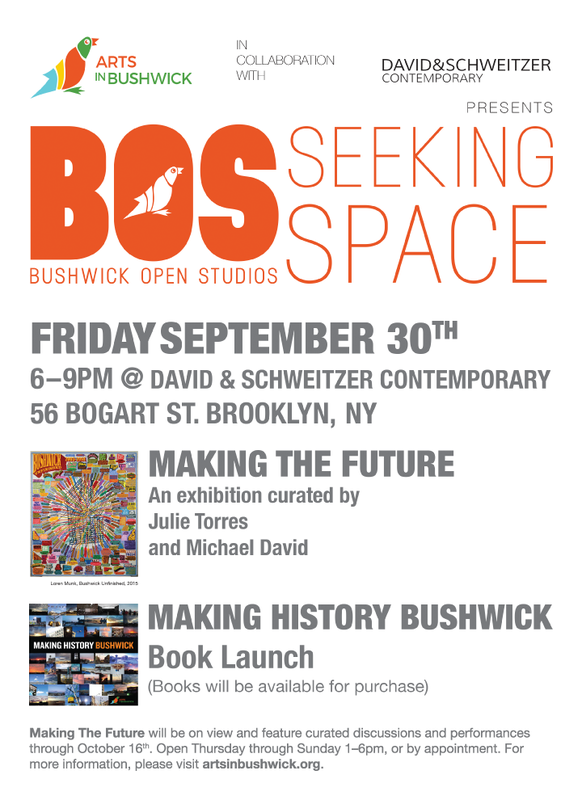 In celebration of the tenth anniversary of Bushwick Open Studios, DAVID&SCHWEITZER Contemporary and Arts in Bushwick are thrilled to present Bushwick Open Studios’ annual open call exhibition Seeking Space, with this year’s official theme, Making The Future. The show will double as the inaugural exhibition for DAVID&SCHWEITZER Contemporary, a new gallery at 56 Bogart Street by owner/directors Michael David and Keith Schweitzer. Michael David is a painter and the founder/ curator of the recently closed Life On Mars Gallery and now Owner/Director/Curator of his latest project in Bushwick. His first one–person exhibition was at the historic Sidney Janis Gallery in 1981 and has exhibited internationally and was represented by M. Knoedler & Co. for over two decades. His work is included in the permanent public collections of the Metropolitan Museum of Art, the Guggenheim Museum, the Jewish Museum in New York, the Museum of Contemporary Art in Los Angeles, and the Los Angeles County Museum of Art, among others. His work will be featured this September at Jewish Museum in Berlin in the exhibition the Golem.